Now that my youngest is almost 9 months old, she’s hell bent on feeding herself. If a spoon or fork goes anywhere near her face, she swipes at whatever’s on it so she can shovel it in her mouth with her own two hands. Because of her new found independence, we just cut food into small bits and put it on her high chair tray so she can go to town on her own. Most of the food ends up on the floor rather than in her mouth though. She thinks it’s funny to throw it all on the floor (I think she wants to give our dog a snack) along with her sippy cup of water. After going through this with my oldest, I decided to find something so don’t have to keep picking her cup and pieces of food up and constantly cleaning the floor. I stumbled upon Tray Haven and I’m so glad I did! I reached out and the company was kind enough to send me one to try out. Tray Haven has made mealtime with my baby so much easier, not to mention there is less to clean up! No more bending over to pick things up over and over and over (because it always turns into a game) and no more constant cleaning of the floor. I wish I would have had one when my oldest was a baby, she was always throwing her food and cups! I give Tray Haven a 5 out of 5 stars. It’s made of quality materials, it’s easy to use, and it works! At $34.99 and available in pink and blue, they make great gifts for birthdays, holidays, and baby showers. Parents and caregivers will be so grateful! Purchase yours here! Like both @burritobuzz and @trayhaven on Instagram. Like the original giveaway post. Tag friends you think are in need of a Tray Haven, too! Don’t forget to like Tray Haven on Facebook and Twitter, too, for product updates! C is a lefty. It’s very apparent, especially when he’s eating. He was having a rough time initially with hand to mouth coordination using a straight spoon and couldn’t grasp the “turn your wrist” concept. This resulted in more food messes along with him getting frustrated that he kept dropping his food. I decided to look into left-handed utensils and found these. Price ($6.25+$5.25 S&H) is a little steep, although this is sold as a set. 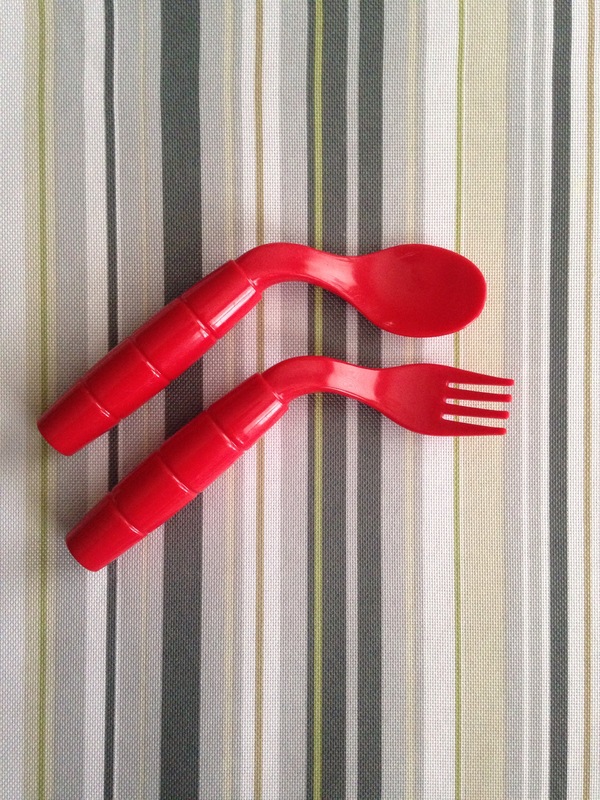 Overall I would give the Easie Eater Fork and Spoon a 4 out of 5 stars with my main concern being the depth of the spoon. Definitely worth the purchase as we have significantly less mess and less frustration during meal times.